I have to confess, as I was getting toward the end of my visit to Berlin, I was starting to have doubts about having planned a four‐week trip. I found myself getting worn out and worn down. I was a little concerned that I was running out of steam just halfway through my trip. Now I’m in Warsaw, and after one day I’m reinvigorated. Some of today was difficult and very sad, but apart from confronting the tragedies that this city, and especially its Jews, have faced, I learned a lot, walked a lot, enjoyed getting back to nearly perfect weather, and just fell in love with Warsaw. The long train ride from Berlin to Warsaw was interesting. I was in a compartment with four other people, and after a while we struck up conversation. We were from five different countries: Poland, India, Ukraine, Turkey, and the US. It was fun sharing travel stories and stories about living in different countries, and the Polish woman gave me some good tips on places to eat and foods to try. She got off at Poznan, and a few other people got on, and they didn’t join our English‐language party, so I did manage to get most of my Berlin blog written before I arrived here. The day started with the hotel breakfast. (It’s called the Chopin Boutique B&B, but it’s really more like a hotel that has breakfast included.) There are some standard recognizable breakfast items (eggs, cereal, cheese), and also some oddities, like pickles, fish, and sauerkraut. 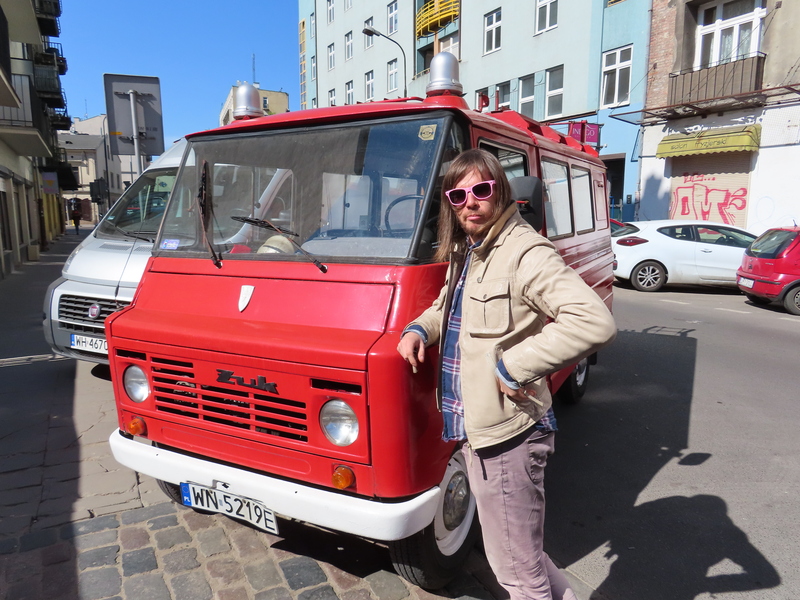 At 10:00 I got picked up for my “Group Tour by Communist Minivan.” I was not looking forward to this, as it sounded kind of touristy and kitschy, but it turned out to be the best city tour I’ve had on this trip so far. Other than me there was a family of three Norwegians, a woman and her parents. Our guide, Lukas, was both entertaining and jam‐packed with historical insight. 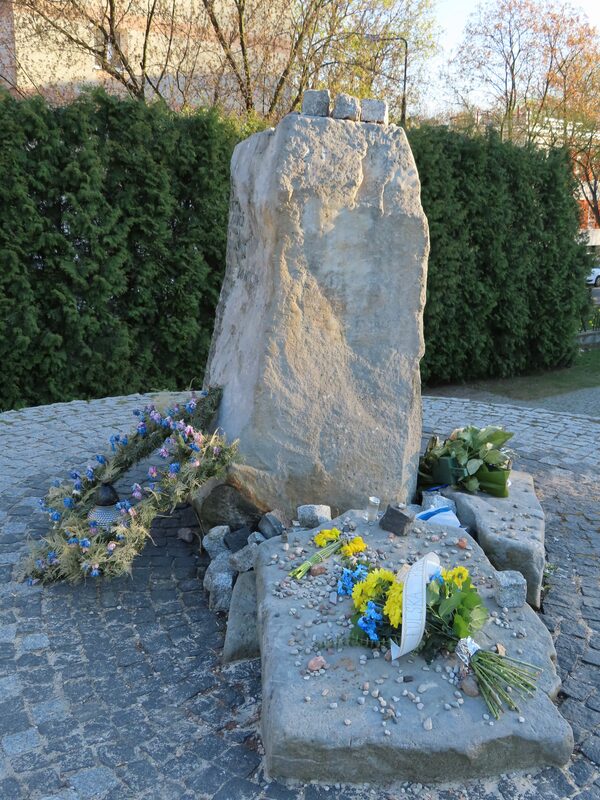 Warsaw, and all of Poland really, have had a challenging history, and much of that was highlighted on the tour. 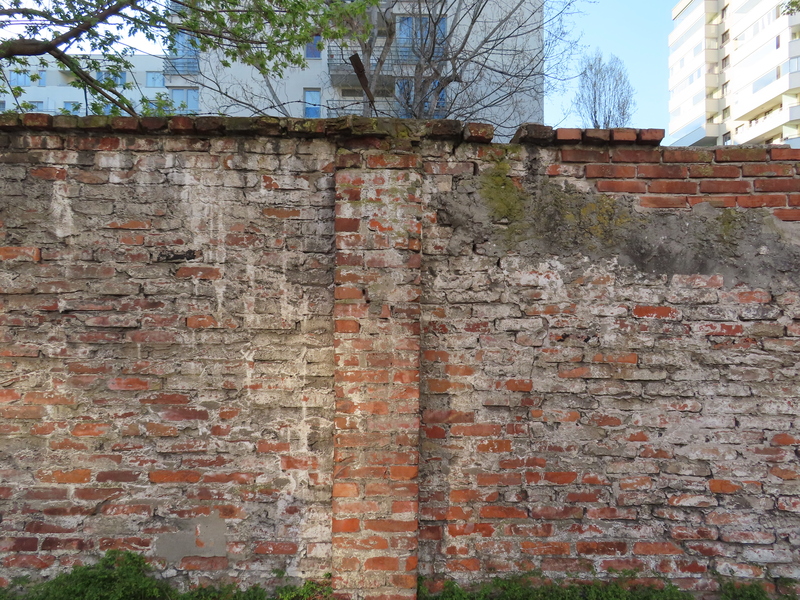 We visited several sights related to the Warsaw ghetto, and though little of it remains, we did see some remnants. If you’ve seen The Pianist, you might remember the scene where Adrien Brody crosses the wooden bridge connecting two part of the ghetto. The bridge is, of course, gone, but a monument of four pillars stands in its place, and nearby you can view pictures of what the street looked like during the war. 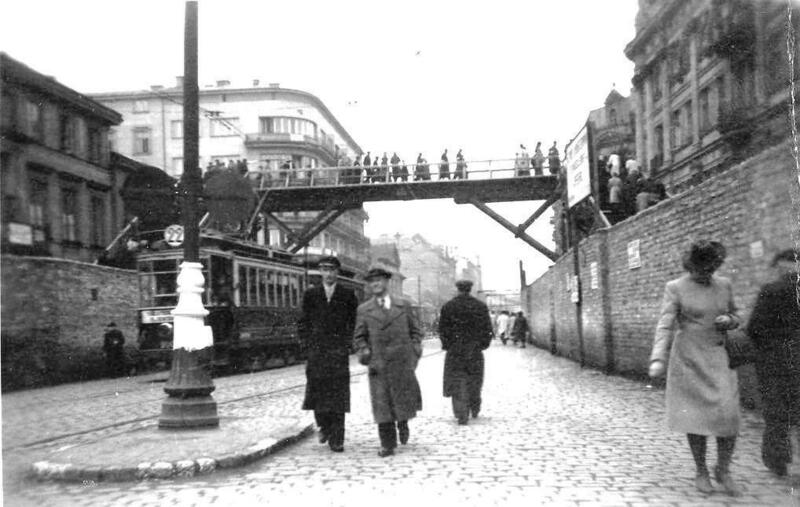 I am standing on Chłodna Street (outside the ghetto). Seventy‐eight years ago I’d have been on the other side. One of few remaining buildings from the ghetto. 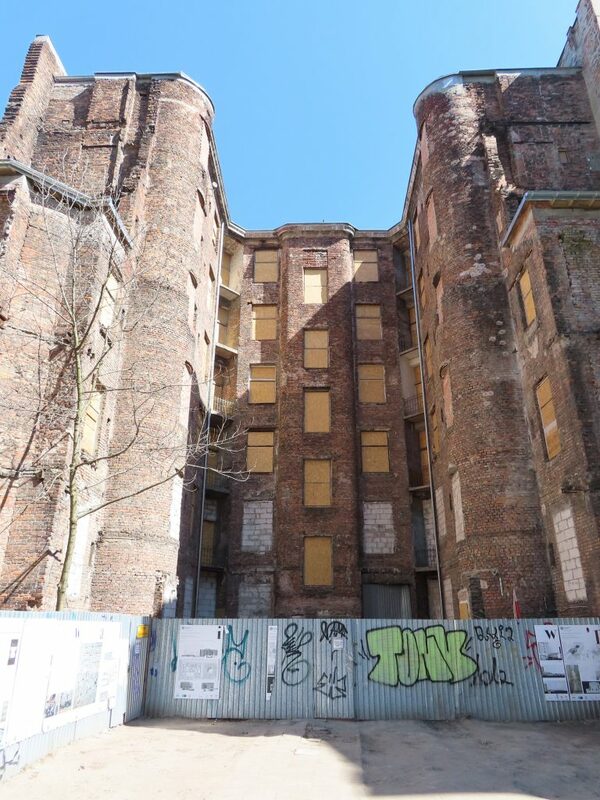 They are in the process of restoring it and it will eventually be open to the public. Not everything we saw was sobering. 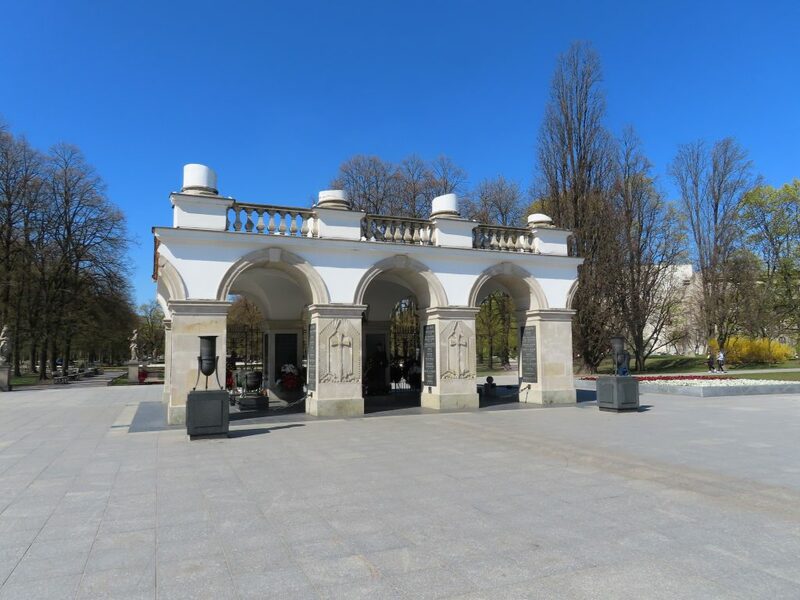 We watched the changing of the guard at the tomb of the unknown soldier, which is in the only remaining part of the Saxon Palace on Piłsudski Square. We visited a historic hotel that has a display on the wall in its lobby listing its many famous guests, from the early 20th century to today. Among the names on the wall were Edvard Grieg, Enrico Caruso, John F. Kennedy, the Rolling Stones, Roman Polanski, ZZ Top, and many many more. And we ended with a stop for a great lunch at a tiny spot in the Praga neighborhood. The Tomb of the Unknown Soldier has been here since 1925. The rest of the palace was destroyed by Nazis out of revenge after the failed Warsaw Uprising of 1944. Lukas said there is a story, maybe true, maybe not, that the Nazis, soldiers themselves, who were tasked with destroying the palace did not want to destroy the monument, so they spared this small part of the palace. After lunch I walked to the Polin Museum. 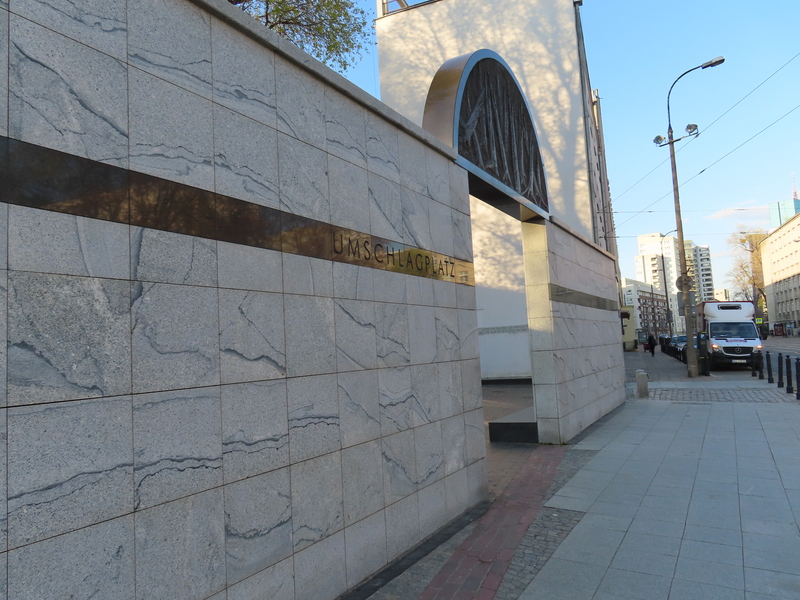 Opened in 2014, this is a museum dedicated to the history of the Jews in Poland. It traces their story from the middle ages through the present day. The people and the rulers of Poland were, for most of their history, welcoming to Jews. For the most part they allowed Jews the same rights and freedoms as all Polish people. Even though there were periods when Jews were blamed for the plague and accused of host desecration, Poland was a haven for Jews who were persecuted in much of Europe. It’s no wonder that by the 1930s there were three million Jews living in Poland. Today there are about 10,000. 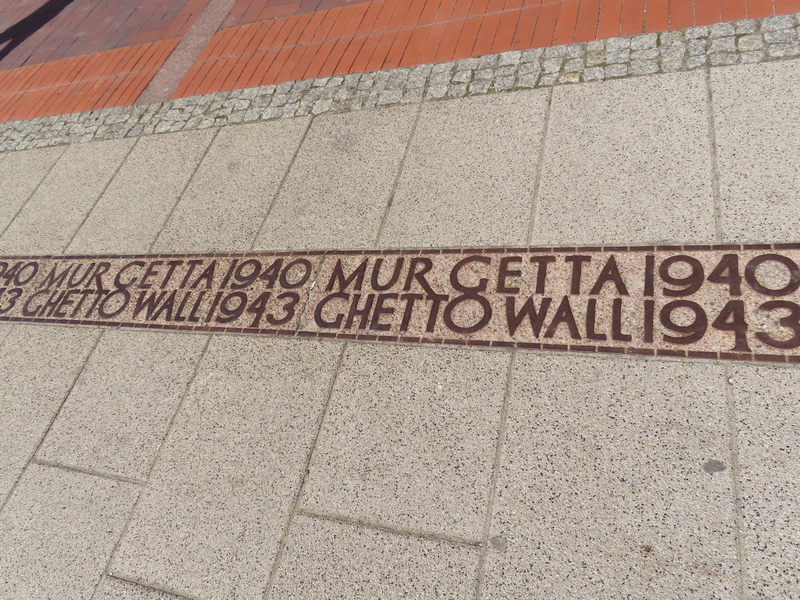 After my visit to the museum I took a short walk in the neighborhood, which was inside the ghetto. Thanks to my Rick Steves guidebook, I found a few more items of interest. The Umschlagplatz monument. Umschlagplatz is the German word for collection point. This was where Jews from the ghetto were collected and held before being loaded onto trains for deportation to the death camps. Led by 24‐year‐old Mordechai Anielewicz, the Jews in the ghetto staged an uprising in 1943. Although it failed, and its organizers knew it was doomed, they did it, according to one of the few survivors, so they could choose the time and place of their deaths. Ultimately they hid in a bunker at this location, and before the SS found them, they committed suicide here. There were 13,000 Jewish casualties; 50,000 others were deported to Treblinka and murdered there. There were just 110 Germans killed. And yet this was the largest single Jewish revolt in World War II. I left a small stone on the monument and shed a few tears. With all the tragedy I confronted today, I still feel energized and uplifted. 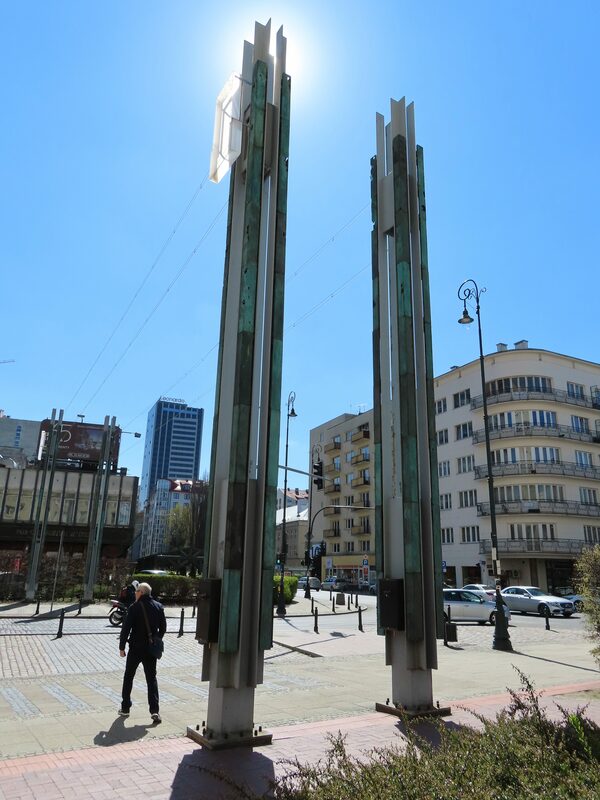 The Polish people themselves have confronted no end of adversity throughout their history, including the near total destruction of this city in World War II followed by 40‐some years of repressive Communist rule. Today this is a vibrant city, largely rebuilt, growing, and thriving. I’m happy to be here. I got back to my hotel in time for the nightly piano concert in the “Chopin Salon.” The pianist was a young Mexican who is studying in Warsaw. He struggled in his short program, but he showed a lot of musical sensitivity. I felt bad for him: besides me there were just three other people in the audience. In addition to the music we got wine and cheesecake. And then I had a nice dinner at a nearby restaurant. When I got back to my room, I did my best to write this blog post but, I confess, I’m finishing it on Tuesday morning. Now I’m off to wander through the old town and see some sights we didn’t cover yesterday. And tonight I’m seeing Billy Budd at the National Opera.